Herbert Walker (12), Albert James (10), and Thomas Hamp (13), schoolboys, of Montague-road, were jointly summoned for damaging the roofing, slates, and chimney of a workshop belonging to William Watts Clarkson, at Clarendon Park, doing 10s. damage on the 18th inst. All boys denied the charge. A son of the tenant of the property spoke to observing the lads on the roof. They were pulling slates off, and removing bricks from the chimney. Witness told them to come down, but they commenced swearing at him. The agent for Mr. Clarkson said damage was constantly being done to this property by boys, and the present summons was taken out as a deterrent. The boys said they went on the roof to collect their tipcat. The Mayor, addressing the parents of the boys, said they regarded the present case as a serious one. It was within the personal knowledge of the Bench that damage was continually being done in all parts of the borough by lads and young men, who seemed to regard property as open to destruction. Having regard, however, to the good character borne by the defendants, they would be discharged on the parents paying the damage and the costs of the prosecution. I wouldn’t call that behaviour mischievous exactly! What naughty boys. By 1901, only one of them – Thomas Henry Hamp – was still living at Montague Road (number 89). Albert Arthur James and his enormous family of mother, father, 5 sisters and 4 brothers had moved to 9 Cecilia Road – a two bedroomed house! And Herbert Walker was no longer in Clarendon Park. Maybe it was the shame of having been in court that made the family move away? Anyway, overcrowding is a recognised cause of delinquency and there was certainly plenty of that in Clarendon Park in the 19th century. Let us hope that the boys made good in the end. Certainly Thomas Hamp was in work as a shoe heel fitter in 1901 and a trimmer’s labourer in 1911, so there is every chance. So his works were at Clarendon Park. Perhaps this was where those mischievous boys were removing bricks and swearing? Or maybe it was one of the many smaller workshops in the area (many still standing). Mr Clarkson seems to have owned quite a bit of property, and much of it was attacked by vandals and thieves. In May 1886 James Duke was sentenced to 6 months hard labour for stealing two water cisterns from empty houses in Knighton, the property of Mr Clarkson. The idiot had simply cut the cisterns from the wall, leaving the pipes overflowing and considerably damaging the houses in the process. The cisterns weren’t worth anything much and James Duke had a well paid job as a plumber, so goodness knows what he was thinking. Astonishingly, on his death in Middlesex in 1914, William Watts Clarkson was worth just £5. Maybe the cost of having his properties pulled apart by small boys and lunatic plumbers was just too much. Regards, Elizabeth. The postcard reads: “Dear Mrs. Stevens, We arrived quite safe at Whitwick & are enjoying ourselves very much. I have seen Mother & Father and they are quite well, I hope you are. Give my love to Mr. Stevens & yourself. It is much quieter here than in Leicester, the air is much fresher. 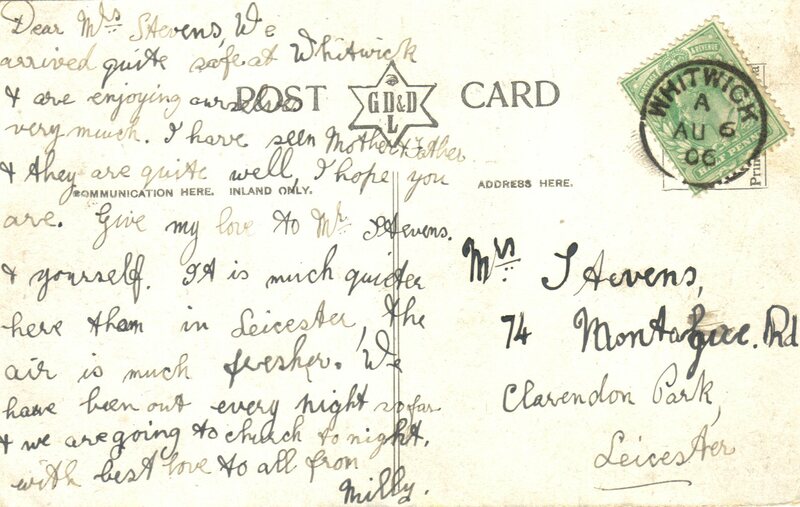 We have been out every night so far & we are going to church tonight, with best love to you all from Milly.” The postmark show that it was sent from Whitwick A on August 6th 1906, to Mrs. Stevens, 74 Montague Road, Clarendon Park, Leicester. Now, as to “Milly”, the author of the postcard…I have looked into various possibilities. Could she have been a sister of John or Sarah Ann? Neither set of their parents seems to have been alive in 1906 so her reference to “Mother and Father” precludes that. I can’t find any obvious links to either the Jelleys or the Stevens but as always, a simple solution has been staring me in the face, in the form of a Millicent Emily Jelly living at 20 Montague Road in the 1901 census. There is absolutely no proof, nor any clue to a relationship, but it does seem more than a coincidence. Millicent and Jell(e)y are two names that few people have attempted to put together (very wisely, I feel. Though in searching I did find a baptism for Kelly Jelly, which amounts to child abuse in my view), and to be living in the same road is enough to satisfy me, in a strictly non-professional way of course. As to Milly’s remarks, whomever she may have been….she was obviously enjoying her holiday in sunny Whitwick (near Coalville) and who can blame her? Out every night and church on Sunday. The air must have been noticeably fresher, away from the factories and the smog of coal fires in close terraced houses. 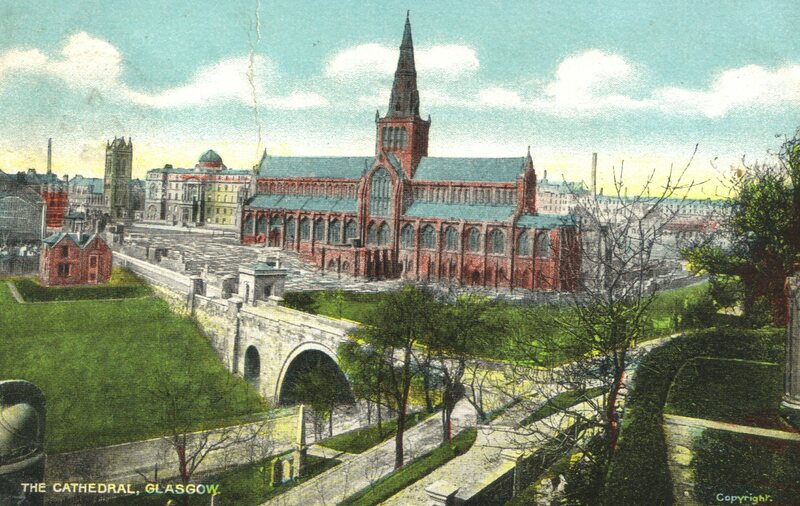 Though why she chose to commemorate with a postcard of Glasgow is anyone’s guess. If it was Milly Jelley then she would have been 14, just old enough to have started work, possibly as a tailoring machinist as she was in 1911. She went on to marry Albert Hambly in 1922. I have a small collection of postcards to Clarendon Park. I find them just as interesting as postcards of Clarendon Park. I hope you agree. Regards, Elizabeth. Alfred Tracey (60) shoehand, Avenue-road Extension, was summoned for assaulting Eliza Bree, married, of the same road, on the 14th inst. Defendant pleaded guilty, but alleged provocation. Mrs Bree told the magistrates that Tracey, who lodged in the Avenue-road, came home while complainant was there. Defendant struck her with his fist, and also with a brush. She gave him a return blow. Tracey said that a dispute arose between him and Mrs. Bree, and from words they came to blows. Fined 10s., in default seven days. Oh dear. Eliza and Harry Bree (both aged 40 in 1898) , a railway porter and a sometime laundress, lived at 266 Avenue Road Extension in 1901 with various children and boarders. It must have been very crowded in there at times, so when Alfred Tracey rolled up drunk, perhaps Eliza’s temper was just a little too irritable for him. So he hit her, the bully, and she hit him back! Those laundresses must have had some pretty good arm muscles and she had 20 years on him, so I expect – and hope – it really hurt. Regards, Elizabeth. A week’s temperance mission, under the auspices of this society, was inaugurated on Saturday evening by Mr. Jonathan Smith, of the British Temperance League….On Sunday afternoon Mr. Smith addressed a meeting of men in the Christ Church schoolroom….On Monday night Mr. H. Bedford took the air at the open air meeting at Queen’s Road, Clarendon Park, Mr. Smith again being the speaker, and the Carter family singing selections. Temperance was an important movement in Victorian Britain. Upper and middle class folk were keen to keep the lower classes respectable and working hard, and drink was seen as an evil. They did have a point (though the upper classes certainly enjoyed a drink or two themselves of course) – beer houses, pubs and gin palaces abounded and drunken brawls were a feature of every town and village. There were many different Temperance societies. The British Temperance Society was a northern, teetotal and Christian group. It still exists under the banner of the British National Temperance League, but I can’t quite envisage an open air meeting on the Queen’s road being a success in 2010. A condition of the sale of land to the Clarendon Park Company was that no pubs, etc should be erected, but it didn’t seem to stop the good people of Clarendon Park lifting their elbows. There were several beer shops and off licenses in the 19th century and the last tram to Clarendon Park back from the city centre was notoriously drunken! And as soon as the caveat was lifted on drinking establishments, bars began to spring up on the Queens Road. As an interesting aside, I wonder how many Clarendon Park residents are not allowed to open a beer shop in their home? My house has a deed of covenant which states that I am not allowed to, and nor am I permitted to burn bricks in my back garden. Which is why I have had to turn my hand to historical research, I guess. How else is a gal to make a living? Regards, Elizabeth. Between nine and ten o’clock on Wednesday morning a cow in the Cattle Market became wild, and broke loose, upsetting several people who endeavoured to stop it. Despite the efforts of its drivers, the beast, which seemed fairly maddened, made its way to Stoneygate, rushing at everyone who came in sight. Near the Clarendon Park Congregational Church it made for an old man, but fortunately he succeeded in escaping. It then went for the roadman, but he was behind a gate when it arrived. Rushing up Springfield Road, it turned its attention to some bricklayers working at a new house, and they promptly fled. It was finally driven into a field, where it quieted down somewhat, and later in the morning some more beasts were fetched, and it was returned to the market. So far as can be at present ascertained, no actual casualties occurred, though several persons had very narrow escapes. Mad cows charging through Clarendon Park does not seem to have been a rare occurrence – there were three reported in The Mercury in the previous year! 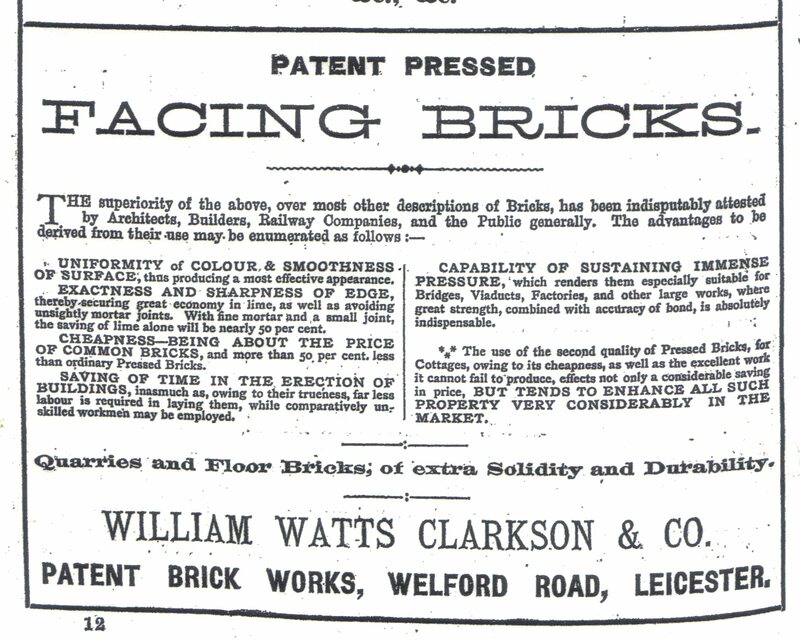 But this article is particularly interesting because it shows how Clarendon Park was still semi-rural and under construction. A mad cow these days would drop with exhaustion before finding a field off the London Road. Regards, Elizabeth. Let’s dive straight into the heart of Clarendon Park, both today and in the past, and look at this wonderful postcard of Clarendon Park . Unfortunately the post mark is almost unreadable so I can’t say exactly when it was posted, but the stamp on the back is a 1/2 penny George V green, meaning that it must have been posted between 1912 and 1918, when the cost of postage doubled (plus ca change!). It was posted from Leicester from ‘Nellie’ to Mrs P Warner of 24 St Paul Road, Coventry. So whereabouts on Clarendon Park Road was this taken? Well, the slightly taller building on the left hand side, just beyond the first block of bay fronted houses, is Knighton Library. In 1912 the library opened in the evenings only, perhaps reflecting the times when Clarendon Park’s largely working class population were free to visit (working hours generally being longer and often including Saturdays). The church in the far background is Christchurch, currently a Methodist/Baptist church. The photographer stood at the corner of St Leonards Road and Clarendon Park Road, facing towards the Queens Road crossroads. 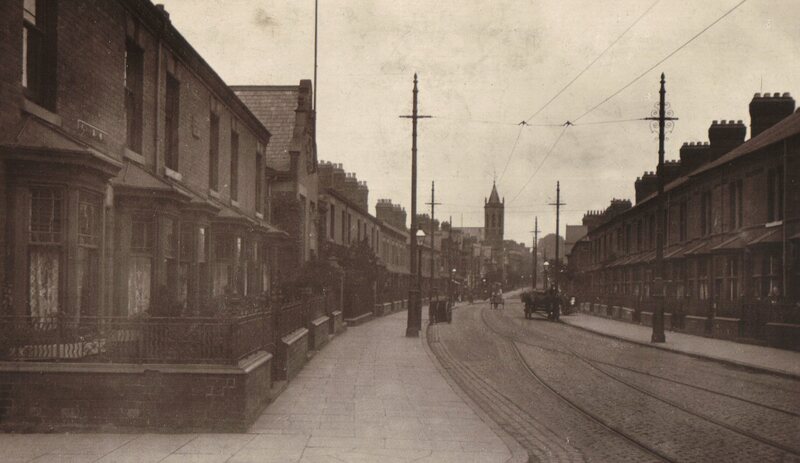 The most striking feature of the photograph is the emptiness of the street, however we mustn’t be tempted to think that the road was usually this quiet in the 1910s. Far from it – the decorative poles to the centre right are holding up tram wires, and this was a busy thoroughfare of electric trams, horse-drawn traffic (one or two horses and carts are visible here) and even motor vehicles. In 1912 Clarendon Park already had a motor engineer works, The Burgess Motor and Engineering Company in Oxford Road, and two motor garages – Sydney Bower of 111a Clarendon Park Road and the Portland Motor Garage and Engineering Co of Portland Street. William Maurice Jackson ran a cab service and livery stable at 1 West Avenue, and bicycles featured strongly in Clarendon Park too – a cycle maker at 60 Montague Road and repairs at the Burgess Motor and Engineering Company. Add the pedestrians shopping at Queens Road and the scores of small shops on Clarendon Park Road itself and it seems much more likely that the photographer had to get up pretty early to catch Clarendon Park Road at this quiet time! It is worth mentioning how tidy Clarendon Park Road looked with its paving in good repair and no so-called home improvements spoiling the look of the terraced houses, which all have tidy front gardens with their original walls and decorative ironwork (to be lost in the war efforts, no doubt). Although when this photograph was taken the houses, and Clarendon Park itself, were just thirty years old. It would be interesting to take a photograph of the same view today and compare the two…..but not with my photography skills! Regards, Elizabeth. I am starting this blog to share with anyone who is interested, the fascinating history of Leicester’s Clarendon Park as I discover it myself. I am a former museum curator and a local and family historian of seventeen years experience, currently enjoying setting up my own history research service. I moved to Clarendon Park five years ago and in that time have been researching the history of its buildings, businesses and people. It is a vibrant area today and, judging from the information I have already uncovered, has always been full of – ahem – character. But more about that in the posts to come. In the meantime, thanks for looking and please feel free to contact me with any questions about Clarendon Park and I will do my best to help. Regards, Elizabeth.